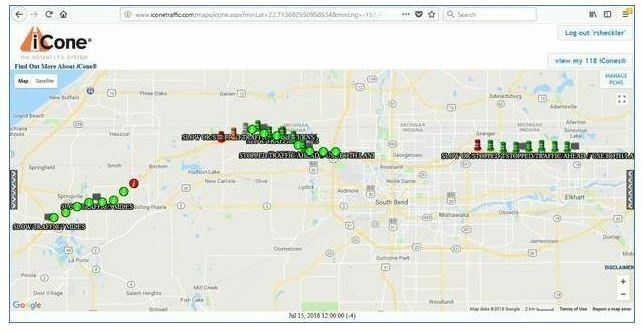 Rieth-Riley Construction Co. Inc. has implemented a real-time message board to combat distracted driving, inform the traveling public and keep its crews safe. When Rieth-Riley Construction Co. Inc. bid for a 73-mile-long reconstruction project on the Indiana Toll Road, the Goshen, Indiana-based company brought some suggestions to the table for the design-build project. Among those ideas was the implementation of a real-time message board to inform the traveling public of traffic issues. However, the system is not just about serving the customer. It’s also about keeping crews safe in work zones. Each system, manufactured and maintained by iCone, Cato, New York, included two message boards and eight smart traffic cones. On this particular project, Rieth-Riley had as many as four real-time message board systems deployed at one time within different work zones along the project. First established in 2008, iCone has been present on thousands of projects nationwide. Rieth-Riley alone has used iCones on around a dozen other projects, including a job on I-94. On that job, the cones also measured traffic to determine when to schedule lane closures. “That ended up cutting a year off the calendar for that one job,” said iCone Managing Partner Ross Sheckler, adding that the success of the job not only saved time and money, but was also the focus of a case study by the Federal Highway Administration. The smart traffic cones, made by iCone, contain sensors which can monitor the speed and number of passing vehicles to determine real-time traffic conditions and then transmit this information to the two message boards. Rieth-Riley placed the eight cones at 1-mile increments from the start of the work zone. The message boards were located 4 miles and 8 miles from the start of the work zone. According to Sheckler, information collected by the sensors within the cones is transmitted to iCone’s servers in New York, where they are run through a number of algorithms to determine the appropriate message to display. Direct communication between each sensor and iCone’s servers in New York means that if one sensor fails, they will still receive data from the other sensors to display on the message boards. iCone offers a handful of preset packages of what messages will display when, but it can also make tweaks as needed by the customer. Common messages include “Stopped traffic X miles ahead,” detour recommendations, or specific instructions about merging. 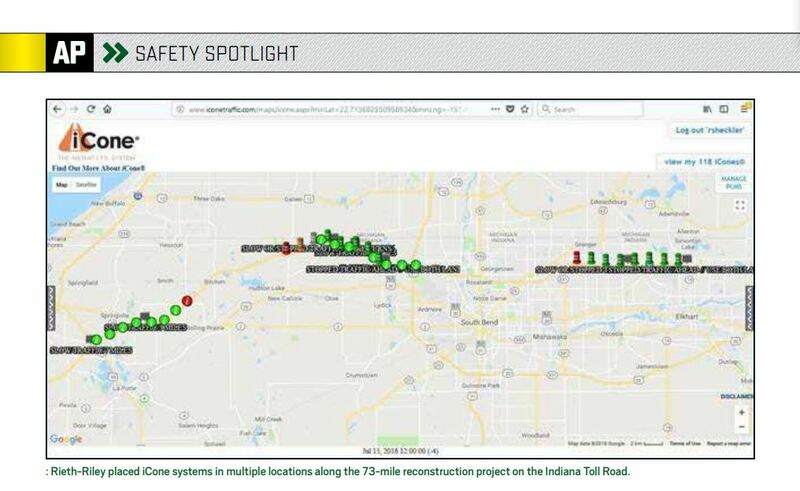 Rieth-Riley placed iCone systems in multiple locations along the 73-mile reconstruction project on the Indiana Toll Road. Additionally, Rieth-Riley was able to work with iCone to ensure that specific people on the crew or with the toll road be notified by text or email in the event of a delay. “We could have one person notified by text if the delay reaches 1 mile, and another notified by email if it reaches 2, and so on,” Kwilasz said. This service also helps the toll road determine messages to display on its other message boards about upcoming road conditions. Users can also log in on iCone’s website to see the real-time status of their work zones. Although this real-time message board technology offers a number of advantages already, this is only the beginning. According to iCone, their cones can also transmit this information to the GPS navigation app Waze, known for offering users crowd-sourced information on traffic conditions and hazards. By the end of the year, iCone data will also go to Google, and eventually, directly to connected cars with integrated communications systems, like those Toyota and GM plan to roll out in 2021. To set up the system on the Indiana Toll Road, Rieth-Riley subcontracted with Traffic Control Specialists. The systems can be deployed by around a dozen traffic control contractors iCone works with, including TCS, AWP, Colorado Barricade and Road-Tech Safety Services in under 30 minutes. For example, the Cadillac Supercruise system, which offers drivers hands-free and foot-free driving, will automatically turn off when driving through a work zone so the driver must focus fully on driving. However, if the technology is implemented incorrectly, that won’t happen. Currently, Cadillac reaches out to states and municipalities directly to find out about active work zones, but in the future with technology like iCone, that will happen automatically.